Kurt Leinenweber with a Walker Module. Click for larger image. What is a Multi-Anvil Apparatus? Pressure and temperature conditions achievable in common large volume presses. 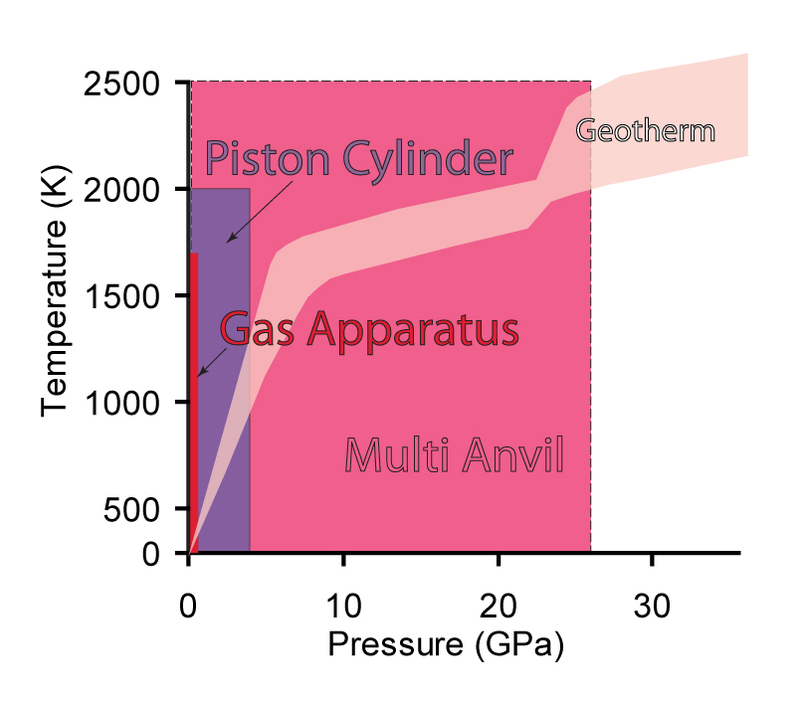 The geotherm is given for comparison. Click for larger image. A Multi-anvil apparatus is one of a class of devices used to generate high pressure in the laboratory. In particular, they are part of a class of high pressure devices called Large Volume Presses (LVP) because the pressurized volume is on the order of millimeters or larger as opposed to the The Diamond Anvil Cell (DAC) for which the pressurized volume is on the order of tens of microns. 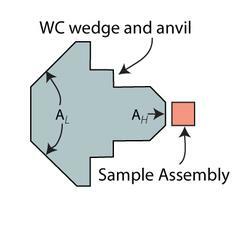 The name multi-anvil refers to the fact that the pressure is achieved by compressing the sample volume with a number (typically 4 or 6) of hard anvils. Diagram of a wedge and anvil from the DIA press showing the area over which the hydraulic press applies force AL vs. the area that contacts the sample assembly (AH). Click for larger image. Nearly all high pressure devices utilize the principle that pressure (P) is equal to an applied force (F) divided by the area (A) over which it is applied. Therefore, pressure can be increased by reducing the area over which force is applied. The anvils used in the multi anvil are composed of very strong materials (such as tungsten carbide (WC) or sintered polycrystalline diamond or boron nitride (BN)) and are designed so that they have a large surface area on one side and a small surface area on the side that contacts the pressurized volume. There are two common geometries for multi-anvils, the so called 'DIA' that uses 6 anvils to compress a cube and the 6/8 geometry that uses 8 anvils to compress an octahedra. 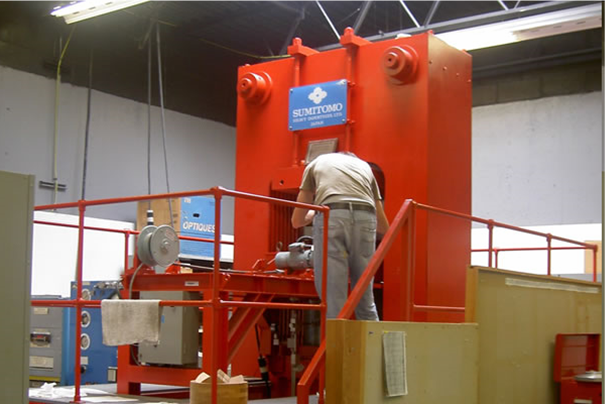 In both cases a large hydraulic press is used to drive the anvils together. How Does a Multi-Anvil Apparatus Work? Talpus 2000. Click for larger image. 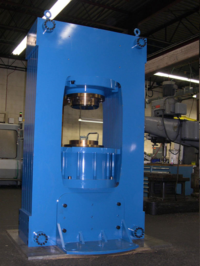 A multi-anvil apparatus can be thought of as having three main components: 1) a hydraulic press that provides the force, 2) a high pressure module that contains the anvils and 3) a sample assembly sample assembly. Hydraulic press. Click for larger image. 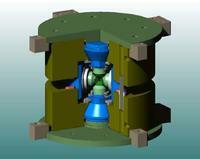 The multi-anvil apparatus requires a hydraulic press to generate force that drives the anvils together. 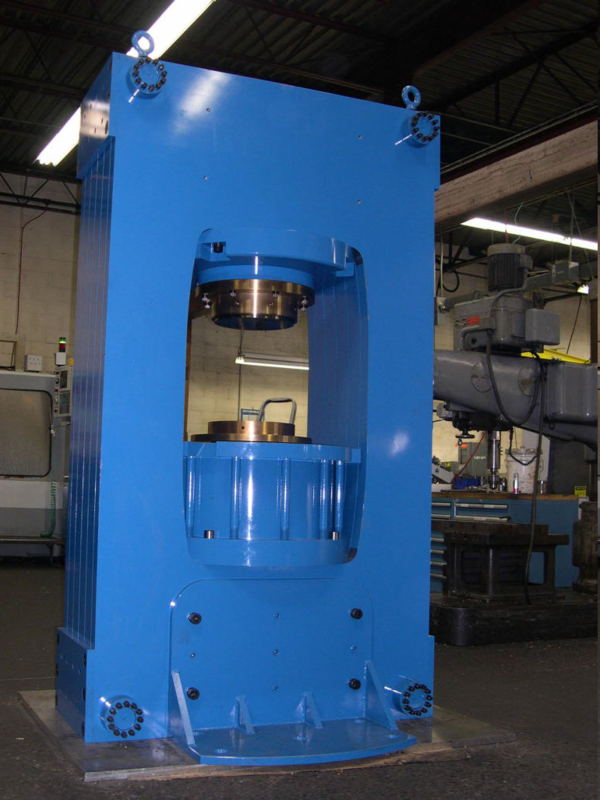 Some presses are quite large and some are more modest in their dimensions. All of the presses rely on the pressurization of hydraulic fluid to drive a ram towards a stationary platen. The frame of the press keeps the hydraulic ram from displacing the platen. In other words, the frame reacts the force generated by the ram and must therefore be very strong and very stiff. Common designs include thick tie rods with platens bolted onto them or an oval hole in a series of thick steel plates. The module is a clever mechanical device that takes the simple forward motion of the hydraulic jack and converts it into the inward motion of the anvils. The exact geometry depends on the type of multi-anvil, but generally this is accomplished by strong metal parts with angled faces that slide against each other. Multi anvil 1000 ton press at GeoSoilEnviroCARS. Click for larger image. 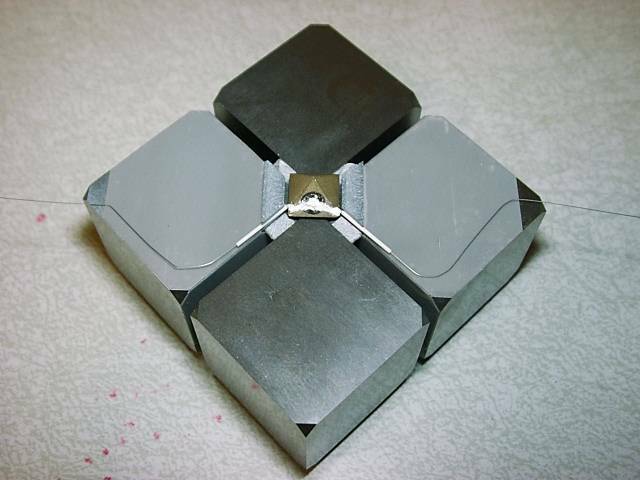 4 of 8 tungsten carbide cubes surrounding octahedral sample assembly, thermocouple wires extinct to right and left, and the pyrophyllite gaskets help keep assembly in place. Click for larger image. D-DIA module. Click for larger image. For all multi-anvils the compressed volume is called the "sample assembly". 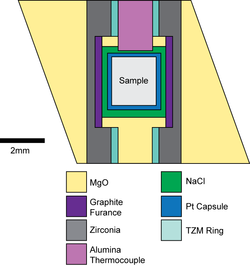 Sample assemblies vary widely in design and size depending on the pressure (P) temperature (T) conditions desired and what type of experiment is being conducted. 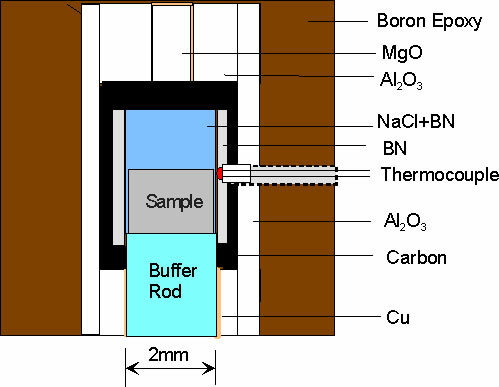 Common elements of sample assemblies include a soft pressure medium in the shape of the compressed volume, a furnace that converts either AC or DC current into heat, a very soft confining media immediately adjacent to the sample and a sample jacket that protects the sample from chemical reactions with other parts of the sample assembly. Other components may also be part of the sample assembly, including thermocouples to measure temperature, hard pistons to either deform the sample or conduct ultrasound in and out of the sample assembly, or wires to measure the electrical properties of the sample. D-DIA sample assembly. Click for larger image. Redrawn from: Burnley, P.C., and Zhang, D., 2008, Interpreting in situ x-ray diffraction data from high pressure deformation experiments using elastic-plastic self-consistent models: an example using quartz, Journal of Physics: Condensed Matter, vol. 20, p. 1-10. 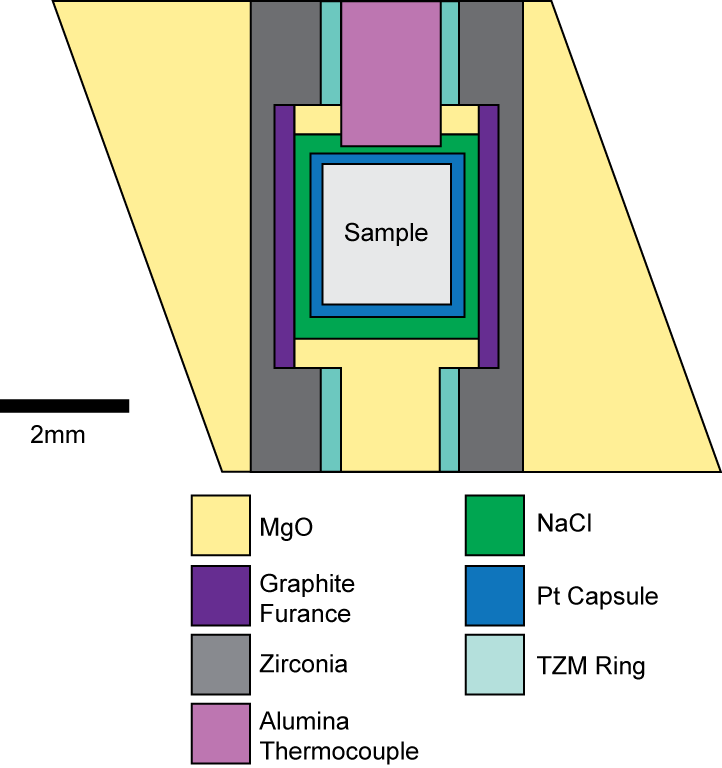 Diagram of the 10/5 graphite furnace assembly. Click for larger image. Cell assembly. Click for larger image. in the multi-anvil. The pressure media (either in the shape of a cube or octahedral) is larger that the space between the anvil when the anvils are touching. During pressurization, the pressure media squeezes out into the spaces between the anvils until the friction between the pressure media and the anvils balances the pressure generated inside the sample assembly. Thus the pressure media must be soft enough to flow at room temperature but not so soft that it completely squeezes out between the anvils. Another function of the pressure media is to provide electrical insulation between the furnace, anvils, sample and any thermocouple or other sensor wires. The most commonly used materials are boron epoxy, mullite and pyrophyllite. 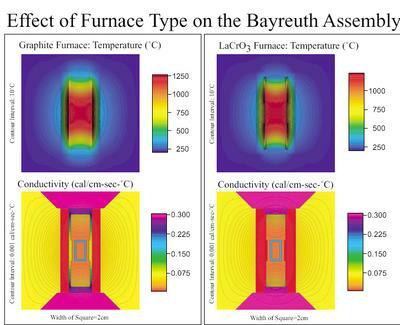 Furnaces use electrical resistance to heat the sample. 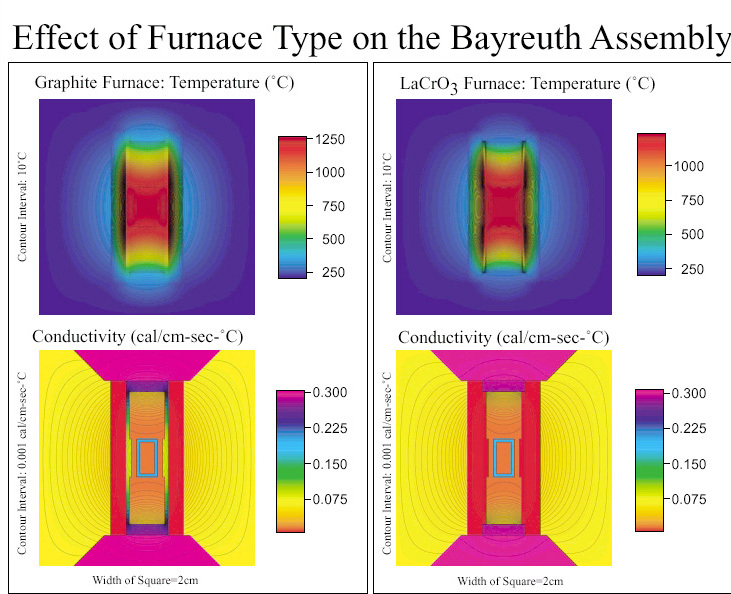 A common geometry for the furnace is a tube that either contacts two of the anvils or is connected to two of the anvils by a conductive material. In order to ensure that the electrical current runs through the furnace, the two anvils that are touching the furnace must be electrically insulated from each other. Either AC or DC current may be used with the furnace. The choice of furnace material depends on the P-T conditions desired and whether or not the experiment requires diffraction from multiple directions or radiographic images. Common materials include graphite, which is x-ray transparent but converts to diamond at higher pressures or lanthanum chromite (LaCrO3) which is stable to higher temperatures and pressure but absorbs x-rays and is more difficult to use below 1000 C. In some cases metal foils are also used as furnace materials and there are also furnace geometries that consist of parallel plates rather than tubes. The confining media sits immediately adjacent to the sample. Its role is to protect the sample from the furnace, to distribute pressure evenly along the sides of the sample, and in some cases also functions as a sample jacket. 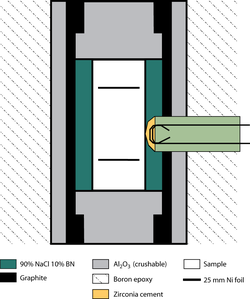 In synchrotron experiments the confining media may also be used as a pressure standard. Common confining media include boron nitride (BN) and magnesium oxide (MgO) which are soft, have a high melting temperature and are chemically inert. Sodium chloride (NaCl) is another popular confining media, it is extremely soft and functions as a good x-ray pressure standard but has a lower melting temperature and can chemically react with the sample at higher temperatures. The role of the sample jacket is to contain the sample and protect it from chemical reactions with other parts of the sample assembly. In some cases the confining media may serve as the sample jacket. 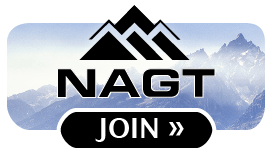 Generally, if a separate jacket is used, it consists of a metal tube or foil, commonly platinum (Pt), gold (Au), or nickel (Ni). The choice of material depends on whether the experiment will be conducted in a synchrotron that requires an x-ray "transparent" material (e.g. Ni foil) or if the experimenter wishes to seal water into the sample (in which case they may choose a crimped Pt or Au tube that has been arc welded shut). The sample is the material that one is studying. 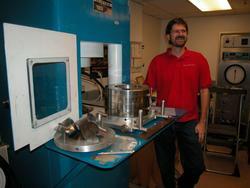 Most earth materials can by studied in multi-anvil presses. However, there are limitations. Volatiles are difficult to contain and may diffuse away over the course of the experiment. Samples that are gasses or liquids at room temperature and pressure are too compressible and too difficult to encapsulate. Single crystals may be used, but may crack during pressurization or decompression unless special precautions are taken. Solid chunks of material make good samples but can be tricky to fabricate. Therefore, packed powders are the most popular starting materials for samples. Pressure calibration curve. Click for larger image. The simplest way to think about the pressure inside a multi-anvil cell is to use relationship between pressure and force over area. From this simple equation, in theory, one should be able to calculate the pressure inside the cell by knowing how hard one is pushing on the outside surfaces of the anvils and knowing the surface area of the anvil faces. However, it turns out that it is not that simple. 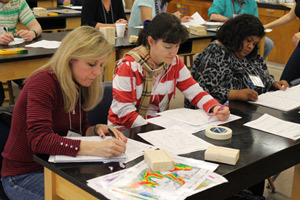 In the section about pressure media, we discussed how the pressure media squeezes out between the anvils until the friction between the media and the sides of the anvils balances the pressure inside. 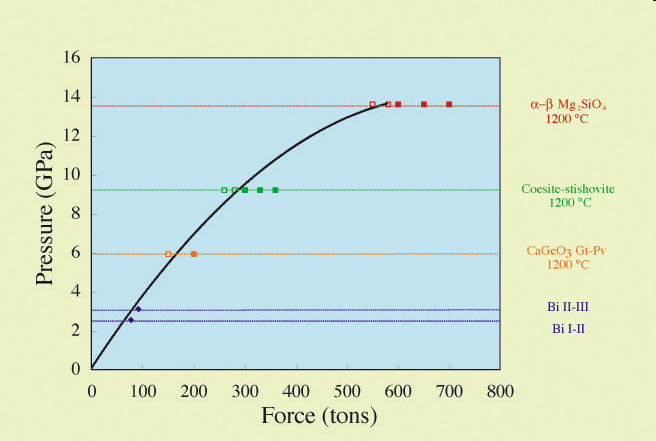 This friction adds significantly to the force that one must apply to the anvils to move them inwards and because the degree to which the pressure media squeezes out and the room temperature shear strength of the pressure media are not well known or even entirely knowable, the frictional force is also unknown. Therefore, the pressure inside the cell must be measured in some other fashion. 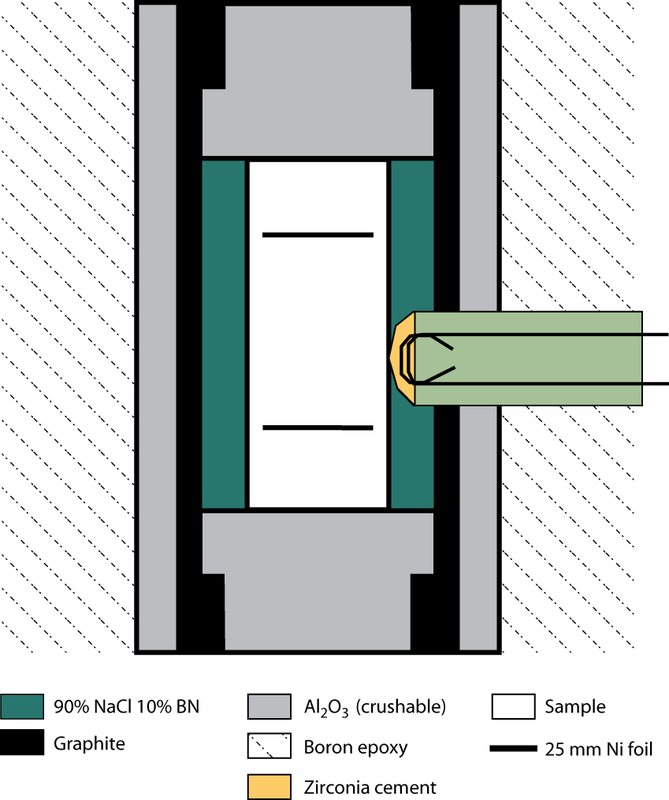 Prior to the use of synchrotron x-rays, the only way to determine the pressure in the cell was to develop a calibration curve for each sample assembly design that allowed one to determine the pressure inside the cell from the pressure in the hydraulic fluid that drives the hydraulic rams. 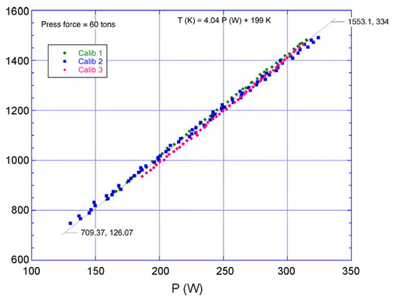 Phase transformations that occur at well known PT conditions are used to determine the calibration curves. With the advent of multi-anvil designs that can accommodate synchrotron x-rays, in-situ measurements of pressure inside the multi cell became possible. In this case a pressure standard is used. Good pressure standards need to have several features. First it must have a low shear strength so that the pressure within is fairly hydrostatic. Second it must be fairly compliant; in other words, there needs to be a relatively large change in its unit cell dimensions as pressure increases. Third, the equation of state (EOS) for the material must be well known. 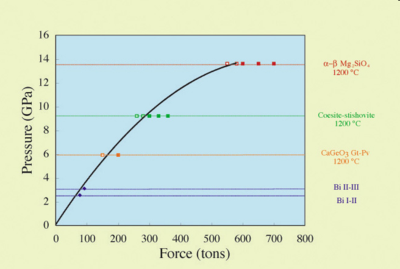 The EOS is the relationship between unit cell volume and pressure and temperature. 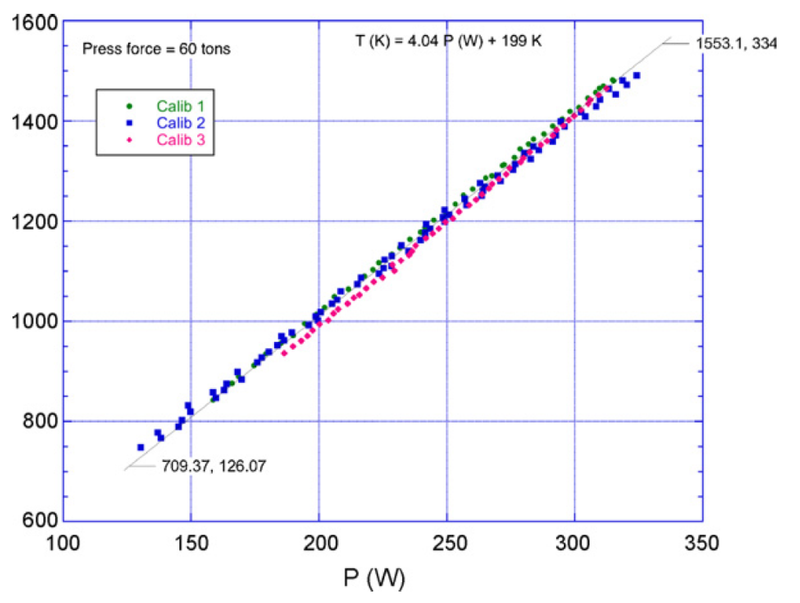 Temperature inside the multi-anvil cell can be determined in two ways; with a thermocouple or by a calibration curve that relates temperature to the power dissipated by the furnace. Because the thermocouple wires must emerge from the cell between the gaps in the anvils, where the pressure medium is squeezing out, they must be very strong. The most common wires used are a W-Re alloys. Thermocouples often do not survive for the duration of the experiment and can be difficult to fabricate. Therefore some experimentalists choose to make a series of experiments with a given sample assembly where the sample consists of a pair of minerals that participate in a well calibrated geothermometer. 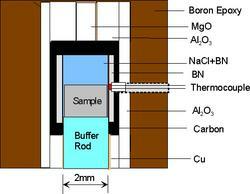 Each experiment is conducted at a different furnace power. After the experiment is over the sample are analyzed to determine the temperature and a power vs temperature calibration curve is constructed. The temperature in subsequent experiments can then be derived from the record of the power applied to the furnace. There is a vast literature describing experiments done in the multi-anvil cell. The multi-anvil has been used to study the behavior of earth materials in the lower crust, throughout the upper mantle and into the shallower parts of the lower mantle, including the petrology and rheology of mantle phases, transformation mechanisms, reaction kinetics, diffusion, electrical conductivity, and sound velocity at high pressure. It has been used to discover new high pressure phases and to synthesize and study the crystallography of many high pressure phases. Synchrotrons are particle accelerators that can be used to produce high fluxes of energetic x-rays that will penetrate substantial quantities of low Z materials (Z stands for atomic number). WC is not x-ray transparent but materials like mullite, pyrophyllite and Boron epoxy are. Multi-anvil devices are particularly well suited for use with synchrotron x-rays because the x-rays can pass through the gaps between the anvils where the pressure media is squeezing out and enter the high pressure region. There are both DIA designs and 6/8 designs that can be used with syncrhtron x-rays. Synchrotrons that produce the type of x-rays required for these experiments are very expensive and very large; there are only a small number of such facilities world-wide. Since multi-anvil presses are not very portable, one generally takes the sample assembly to a synchrotron that has the type of multi-anvil press that one wants to use. Synchrtron beam lines with multi-anvil presses include x17b2 at the National Synchrotron Light Source, and GSECARS at the Advance Photon Source. Setup. Click for larger image. In addition to thermocouples, other sensors can be used in conjunction with the multi-anvil. 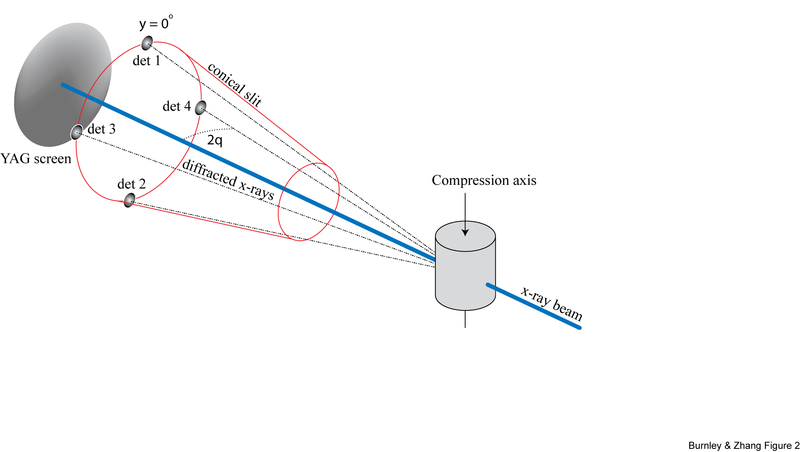 For example, ultrasonic studies which examine the sound velocity of materials at high pressure are conducted in the multi-anvil both with and without synchrotron x-ray. 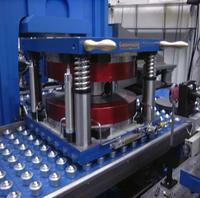 High pressure faulting studies may be conducted by attaching an acoustic emission system to the anvils. 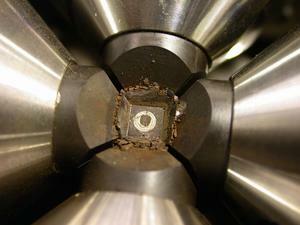 High electrical properties can also be studied in the multi-anvil. The design of the DIA apparatus has been modified to allow it to impose a controlled uniaxial stress on the sample by incorporating small hydraulic jacks within the upper and lower wedge blocks. This apparatus is called a D-DIA. 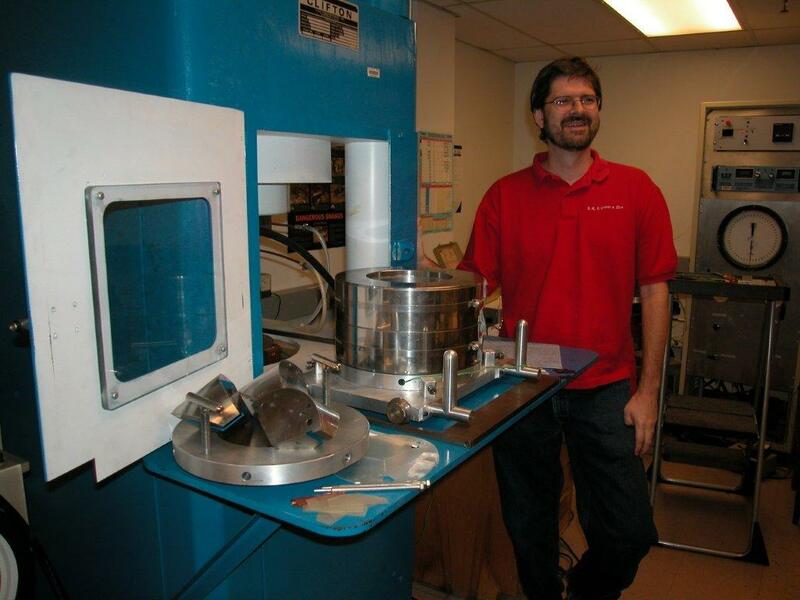 The D-DIA uses synchrotron x-ray diffraction from the sample to measure the sample stress and radiographs to measure the sample length. A more in-depth discussion of the D-DIA can be found in the high pressure deformation section. Diffraction geometry for D-DIA experiments. Click for larger image. D-DIA radiograph. Click for larger image. Uncertainty in pressure and temperature are related in that one generally feeds into the other. The pressure in the cell changes during heating and cooling due to thermal expansion and contraction of the cell parts. Pressure standards are usually temperature dependent and even the voltage produced by thermocouples is affected by pressure. 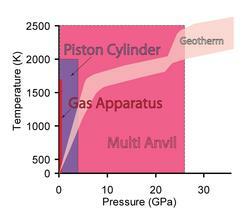 Since the temperature at the interface between the pressure media and the anvil is relatively low (<50 C), there will be substantial temperature gradient between the hot spot of the furnace and the outside of the cell. Cell designs attempt to produce relatively small temperature gradients within the sample, but there are always some variations in temperature across the sample. Temperature and conductivity comparison between different furnace materials (graphite vs. LaCrO3). Click for larger image. Pressure is generally envisioned to be "hydrostatic" within the multi-anvil cell, but the confining media are quite strong relative to fluids (which produce genuinely hydrostatic conditions) so there is some level of nonhydrostatic stress within the sample. The level of nonhydrostatic stress depends on the temperature of the confining media and the design of the sample cell and is usually not well known. The uncertainty in pressure and temperature is compounded by the fact that all high pressure methods suffer from some degree of uncertainty, so even the "well calibrated geothermometer" and the material with a "well known equation of state" are not known with absolute certainty. Therefore, as with all science, one must keep in the back of one's mind that future technological advances may force us to revisit results that are considered state of the art today. Perhaps the greatest comfort to multi-anvil users is that the seismic discontinuities at 410, 520 and 670 km show up at the right depths to match the laboratory determined pressures for the phase transformations from olivine to wadselyite to ringwoodite and then to perovskite and magnesiowustite. Gwanmesia, G.D. Liebermann, R.C. Guyot, F. (1990) Hot-pressing and characterization of polycrystals of beta-Mg2SiO4 for acoustic velocity measurements. 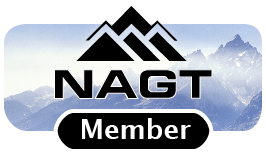 Geophysical Research Letters 17: 1331-1334. Hernlund, J., Leinenweber, K., Locke, D., Tyburczy J.A. (2006) A numerical model for steady-state temperature distributions in solid-medium high-pressure cell assemblies. American Mineralogist 91, 295-305. Kawai, N., Endo, S., (1970) The generation of ultrahigh hydrostatic pressures by a split sphere apparatus. The Review of Scientific Instruments 41, 1178-1181. Liebermann, R.C., Wang, Y. (1992) Characterization of sample environment in a uniaxial split-sphere apparatus. In: Syono and Maghnani (eds.) pp. 19-31. Syono, Y., Maghnani, M.H. (1992) High-pressure Research: Application to Earth and Planetary Sciences. TERRAPUB, Tokyo. Walker, D., Carpenter, M.A., Hitch, C.M. (1990) Some simplifications to multianvil devices for high pressure experiments. American Mineralogist 75, 1020-1028. For more information about The Multi-Anvil Apparatus follow the links below. Multi-Anvil Web A website set up by Kurt Leinenweber and Kevin Righter to serve the multi-anvil community. 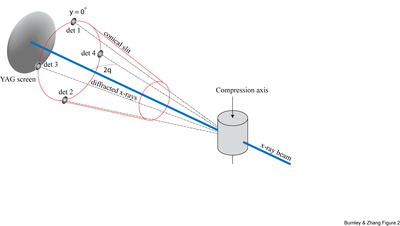 Burnley, P.C., and Zhange, D., 2008, Interpreting in situ x-ray diffraction data from high pressure deformation experiments using elastic-plastic self consisten models: an example using quartz, Journal of Physics: Condensed Matter, vol. 20, p. 1-10.
redrawn from: Burnley, P.C., 2005, Investigation of the Martensitic-like transformation from Mg2GeO4 Olivine to it's Spinel Structure Polymorph: American Mineralogist, vol. 90, No. 8-9, p. 1315-1324. Duurham, W.B., Mei, S., Kohlstedt, D.L., Wang, L., Dixon, N.A., 2009, New Measurements of activation volume in olivine under anhydrous conditions: Physics of the Earth and Planetary Interiors, v. 172, p. 67-73.